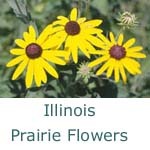 The Illinois Prairie Flower Photo Gallery contains a searchable archive of 250 images of prairie plants. One can view closeup images of full herbarium sheets of plants and view details in Eyespy software. The entire searchable Herbarium database contains 110,000 entries. This archive supplements the MuseumLink Illinois Web module Illinois Prairie.